Schools in the U.S. will now have the opportunity to go against the grain of First Lady Michelle Obama's healthy lunch program. A massive year-end spending bill released by Congress Tuesday doesn't allow schools to opt out of healthier school meal standards championed by the First Lady, as House Republicans had sought. But it would ease standards that many students and school officials complained about. The bill would reduce requirements for whole grains, and would put off rules to make school meals less salty, suspending lower sodium standards that were supposed to go into effect in 2017. Some school nutrition directors have lobbied for a break from the standards, which have been phased in since 2012, saying the rules have proven to be costly and restrictive. Some kids don't like the meals, either. House Republicans have said the rules are an overreach, and have fought to ease them. As the debate escalated this summer, Michelle Obama said she would fight "to the bitter end" to make sure kids have good nutrition in schools. The White House did not have immediate comment on the language in the spending bill. Many schools have complained that the whole grain standards are a challenge, especially when preparing popular pastas, biscuits and tortillas. Food service companies don't have as many options in the whole wheat varieties, and preparation can be more difficult, especially with some whole wheat pastas that can be mushy and hard to cook. Last year, a school official in Kentucky reported that the students said the healthier fare "tastes like vomit." However, some advocates insist that students just need time to adjust to the changes on the lunch line. In November, students across the country tweeted photos to the First Lady of their less-than-savory cafeteria lunches with the sarcastic hashtag #thanksmichelleobama. The spending bill, expected to become law before the end of the year, would allow schools that can demonstrate they have had difficulty finding and affording acceptable whole grain products like pastas and breads to be exempted from 2014 standards requiring all grain products to be mostly whole grain. Those schools would still have to abide by previous guidelines that half of their grain products be mostly whole grain. The final language is a compromise between the House's attempt to allow schools to opt out of the standards for a year and a Senate provision that called for more study on the whole grains issue. The changes for sodium standards are far off. The 2012 standards already lowered salt levels in school meals, with even lower sodium levels set to start in two years. The bill says the government cannot require the 2017 levels "until the latest scientific research establishes the reduction is beneficial for children." In a statement after the bill was released, Alabama Rep. Robert Aderholt, the Republican chairman of the House subcommittee that oversees agriculture issues, said the whole grains waiver is "the best bill we that are going to get" with Democrats still controlling the Senate. He expressed optimism that the GOP may get more of what it wants when the party controls both chambers next year. The congressional changes have been pushed by the School Nutrition Association, a group that represents both school nutrition directors and the food companies that produce many of the school foods. While the group was looking for deeper rollbacks than included in the spending bill, the whole grain and sodium standards were among its main concerns. The organization's CEO, Patricia Montague, issued a statement late Tuesday saying the group "strongly supports" the language. The Agriculture Department has already shown some flexibility on the whole grain issue. It said earlier this year that schools can put off for two years the requirement that all pastas in schools be mostly whole grain if they can demonstrate that they have had "significant challenges" in preparing the pasta. American Heart Association CEO Nancy Brown said the changes in the spending bill could harm kids' health, even if the bill doesn't dismantle the school meals program. "If Congress hits the pause button now on the sodium reduction, it's possible that more children could develop high blood pressure and be at risk for heart disease or stroke before they even become adults," Brown said in a statement. 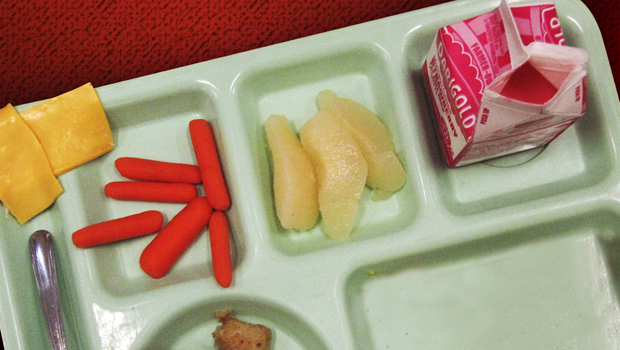 The year-end spending bill won't be the last time Congress takes on the school meal standards, as the overall law governing child nutrition policy, including school lunches, expires next year. Both the House and the new Republican Senate are expected to consider changes to the meal standards as part of legislation renewing the law. On other food issues, the spending bill would allow fresh white potatoes to be part of the federal Women, Infants and Children nutrition program. The Agriculture Department doesn't currently allow them, even though it allows other fruits and vegetables, because it says people already eat enough white potatoes. The program serves low-income children and pregnant and nursing mothers.